Mon, Wed, Thurs, Fri 8:00 a.m. – 5:00 p.m.
Tuesdays: 8:00 a.m. – 8:00 p.m.
Hudson Headwaters offers prompt medical care, given without an appointment, for health concerns that arise suddenly but are not life-threatening. Two of our facilities, the Health Center on Broad Street in Glens Falls and the Warrensburg Health Center have urgent care providers and exam rooms available seven days a week with evening hours. Laboratory and medical imaging (X-ray) services are available on-site. 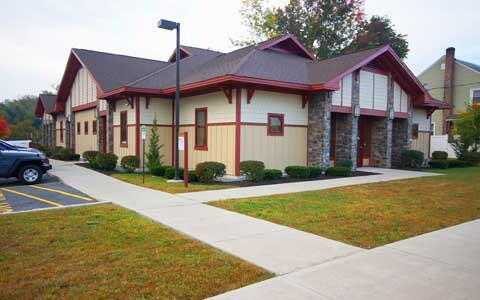 The Fort Edward-Kingsbury Health Center serves people of all ages. We welcome you to be a part of our family—here or at any of our health center locations. Our medical professionals provide comprehensive primary health care services. A wide array of specialty and ancillary services are also available to network patients throughout the region. The services available from providers at this location are listed below. Hudson Headwaters Health Network is a 501(c)(3) nonprofit and Federally Qualified Health Center (FQHC) funded in part through a grant from the U.S. Department of Health and Human Services and generous community support. Hudson Headwaters Health Network is a Health Center Program grantee under 42 U.S.C. 254b, and a deemed Public Health Service employee under 42 U.S.C. 233(g)-(n). Hudson Headwaters Health Network is granted medical malpractice liability protection through the Federal Tort Claims Act (FTCA) and are considered Federal employees with the Federal government acting as their primary insurer.